This 90-degree MIL-DTL-83513 PCB connector (M83513/13) is typically found in sensitive aerospace applications that require weight restrictions. Pin or socket contacts can be ordered in different lengths and quantities. Four jackpost mounting designs are available for all PCB Micro-D connectors. 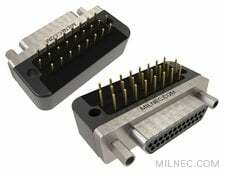 Compatible with MIL-DTL-83513 / M83513.